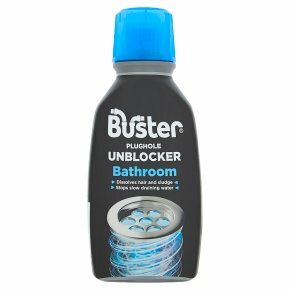 New ultra power formula clears hair and sludge from bathroom plugholes and pipes. Dissolves hair and sludge. Stops slow draining water. For showers, baths and basins. IMPORTANT<br>Read label before use<br>Very toxic to aquatic life<br>Contains sodium hypochlorite, solution 3.2% CI active, sodium hydroxide, N, N-dimethyltetradecylamine N-oxide, Silicic acid, sodium salt<br>Causes severe skin burns and eye damage<br>Do not get in eyes, on skin or on clothing<br>Do not breathe fumes<br>Wash contaminated skin thoroughly after handling<br>Wear protective eyewear, clothing and gloves<br>Keep out of reach of children<br>If medical advice is needed, have product container or label at hand<br>Wash contaminated clothing before reuse. Contact with acids liberates toxic gas. Warning! Do not use together with other products. May release Dangerous gases (chlorine).<br><br>FIRST AID<br>IF IN EYES: Rinse cautiously with water for several minutes. Remove contact lenses, if present and easy to do. Continue rinsing. Immediately call a POISON CENTRE/doctor.<br>IF ON SKIN (or hair): Take off immediately all contaminated clothing. Rinse skin with water/shower.<br>IF INHALED: Remove person to fresh air and keep comfortable for breathing.